Search the National Green Pages to find the green, healthy, and ethically produced products and services you need for home and work. The businesses featured here have earned Green America's Green Business Certification, so you can be assured they are dedicated to building an economy that works for people and the planet. Green America’s Green Business Network® is the first, largest, and most diverse network of socially and environmentally responsible businesses in the country. Businesses in Green America's Green Business Network adopt principles, policies and practices that improve the quality of life for their customers, employees, communities, and the planet. Browse the National Green Pages to find green, healthy, and ethical products & services. 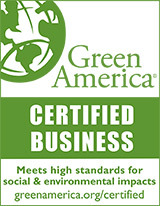 All businesses listed are certified by Green America for their social and environmental impacts. We have reviewed over 8,000 small green businesses and offer one of the oldest and most reputable assurance programs for small businesses committed to social and environmental responsibility. Do you own a Green Business? Comprised of 3,000 businesses, the Green Business Network is home to both rising social and eco enterprises and the most established green businesses around. We provide the tools, the information, and the consumer base to help you thrive in today’s competitive green marketplace.